Kellogg's iconic Coco Pops characters get a bombastic 2018 refresh in new pan-European spots by up-and-coming production studio Piranha Bar. Led by Digitas in London, the new spots envisage a bolder and richer take on Coco the Monkey and his arch nemesis Croc, the dastardly crocodile. 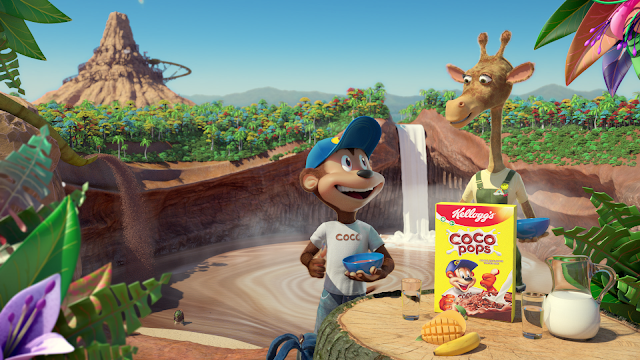 The flagship commercial depicts a swash buckling, nail-biting chase up a ginormous volcanic peak, with some impressive stunt work from Coco, as he surfs through a stream of Krispies and parachutes out of danger. The rich world building and character work by Piranha Bar will be seen in subsequent spots, including the recently released Panini World Cup promotion which sees Coco and his soccer playing friends battling it out in a spectacular jungle ruin setting. Piranha Bar makes beautifully crafted and engaging animation and live action that people want to watch and share. Our hybrid production studio in Dublin creates branded and original content which benefits from our passion for integrating mixed media – often combining live action, 3D animation, VFX and motion design in a single project. Our directors draw on the talents of our in-house team of artists, animators, designers and editors at every stage of the creative process. Agencies and brands benefit from a singular dedicated approach from brief to final polish, all under one roof.